The Dean Jeffries Porsche has unique styling elements added by Dean, a noted California 60's customizer. 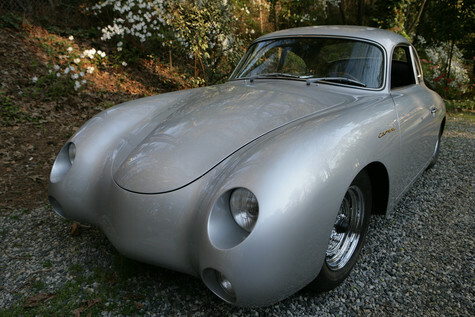 At one time owned by a gangster, this '56 Porsche Carerra was acquired by Jack Walter in 1971 when he was 19 years old, and he has owned it since. By 1957 Dean Jeffries had established himself as a talented custom painter working in the Los Angeles area. He was renting a garage space from George Barris and would apply his talents to many of the cars that rolled through Barris’ shop. Jeffries painted projects such as the Dream Truck, the Aztek, and James Dean’s Porsche 550 Spyder during this tim,e but he wanted to be known as something more than a painter. Dean acquired the featured 1956 Porsche 356 4-cam Carrera and immediately removed the bumpers, extended the nose and crafted many custom features such as frenched headlights, rear scoop with custom grille, new taillights, custom roof vents, and turned aluminum panels to line the engine compartment and door jams. He radically altered the exterior appearance of the car by smoothing the already sleek lines and launched his career as a custom car builder. The Carrera was featured in many of the magazines of the era including an appearance on the cover of the October 1959 Rod & Custom. It won over 30 first place trophies at car shows in southern California during the late 1950’s and early 1960’s. Dean was one of the pioneers of new painting techniques including the use of pearls and metalflake. Many of his contemporaries couldn’t make the paint jobs last as the clear coats they would spray over the new paints would yellow and fade over time. Dean’s secret was the use of aircraft clear – designed to withstand the high UV rays that aircraft were exposed to at altitude. The Carrera was painted with a silver pearlescent paint which it retained until Dean repainted the car in a pearlescent gold shortly before he sold the car in 1962. The Carrera was sold to Albert Nussbaum sometime in early 1962. Nussbaum and his partner Bobby Wilcoxson had traveled to California, and each bought a custom car while they were visiting. Wilcoxson bought the Aztek, a George Barris built custom 1955 Chevrolet now owned by Barry Mazza. As it turned out these two visitors from the east coast were bank robbers on the FBI’s Ten Most Wanted List who were spending some of their money on custom cars. Albert Nussbaum drove the Porsche to Florida where it was spotted near Ft. Lauderdale before disappearing until it resurfaced in 1968 near Orlando. Dean Jeffries went on to create the Mantaray,. This aluminum-bodied asymmetric custom car won the Oakland Roadster show and was featured in “Beach Blanket Bingo.” This Hollywood exposure led him to create many cars for TV and the movies including the Monkeemobile, the Green Hornet car, and the Landmaster from “Damnation Alley”. Jack Walter purchased the Porsche in 1971 in Atlanta when he was 19 years old and has owned it since. He is a huge fan of Dean Jeffries and is putting the finishing touches to restore the Carrera to the way it appeared when it was featured on the cover of Rod & Custom magazine. Sadly, we lost Dean in the Spring of 2013 at the age of 80 – he was a great guy and one of the giants of the California Kustom culture. The Porsche will live on as a tribute to his genius. A 356 Porsche has great lines - especially from 3/4 rear. There was a rear seat, but you better be a midget to fit. This is what a lot of other sports cars saw when they were trying to race a 356 back in the day. The 356 had a few names in its day, but this one carries through even to today!